Genome editing will most likely not be in clinical trials for DMD in the near future! If you want to read the complete explanation of how CRISPR works and what the challenges are exactly, please continue reading. You’ve heard about CRISPR and genome editing and it is amazing potential and how it may be a cure for Duchenne in as little as 3 year. While I would love for this to happen, I do not think this is a realistic picture. And while I do not want to dash your hopes, I do believe there are some things you need to be aware off so you can have more realistic expectations. How does genome editing CRISPR work and why is it so hyped? Let’s start out with some background on how genome editing works and how CRISPR comes into play in this. Our genes consist of DNA and contain the genetic code for proteins. 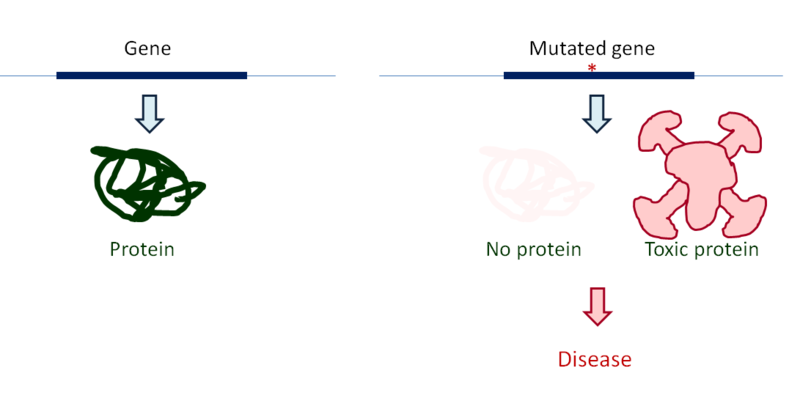 When there are mistakes (mutations) in genes, this will often result in the absence of functional proteins or the production of toxic proteins and lead to disease (Figure 1). Genome editing aims to modify the DNA, to correct the mistake and allow the production of a missing protein or a reduction of toxic protein production. Figure 1. Genes encode proteins. When genes are mutated, this results in disease due to lack of proteins or the formation of toxic proteins. You need tools to modify DNA. Genome editing makes use of the systems in the cell that repair DNA when it is damaged. These systems are activated when the DNA is damaged (e.g. UV light can generate breaks in the DNA of your skin cells). When breaks occur in the DNA, the DNA repair systems are immediately activated, because DNA will quickly ‘unravel’ when it is broken and the cell does not want to lose genetic information. In order to utilize the repair system for genome editing, one needs to activate the repair system by generating a break in the DNA at the location of the mutation. This is where CRISPR comes in – CRISPR is a tool that recognizes specific locations in the DNA and guides an enzyme that can cut the DNA (Cas9) to this location. The beauty of the CRISPR is that one can design the DNA recognizing component (“guide”) to recognize specific parts of the DNA. While there are some rules that have to be adhered to, it is possible to design these components to specifically target most regions in the genome. Thus it now becomes possible to cut at or close to mutations. There are two repair pathways that can be activated, called non-homologous end-joining (NHEJ) and homologous recombination (HR). NHEJ glues the two ends together – however, because DNA often unravels a little bit before the break is repaired, often some of the DNA is lost in this process. HR uses a template and exchanges this for the part that is broken (Figure 2). So here there is no loss of DNA. With this system, you can correct mutations: when you introduce a break close to the mutation and provide a template with the correct DNA this template will be used to repair the break and the mutation is corrected. Unfortunately, the HR system is very inefficient and does not occur at all in non-dividing cells like muscle. So for muscle diseases only the NHEJ system can be used for now. Figure 2. CRISPR Cas9 can cut at a target region in the DNA (close to the mutation). This will activate DNA repair mechanisms. Non homologous end joining (NHEJ) will ligate the two ends of the break – often this will lead to loss of some of DNA subunits, since DNA will quickly unravel and breakdown due to the break. How much DNA subunits are lost will very for each targeted cells, and sometimes this will lead to a deletion of the mutation. Homologous recombination makes use of a provided template, containing the correct genetic information and swaps the region with the break (and the mutation) for the template (without the mutation). This will correct the DNA. However, homologous recombination is a very inefficient process and does appear to occur in non-dividing cells. How does CRISPR work for Duchenne? As explained, in muscle tissue only the NHEJ process is active. The NHEJ process results in minor mutations in the repaired DNA. This is generally not something that is desired. However, for DMD this loss of DNA can be exploited to restore the genetic code of the dystrophin gene. As you are probably aware, DMD is caused by mutations in the dystrophin gene that disrupt the genetic code. For most genes, including dystrophin, the genetic code lies dispersed over the gene in so called exons. Most DMD patients miss one or more exons, causing the genetic code to be disrupted (Figure 3). When patients miss exons without disrupting the genetic code, a partially functional dystrophin can be produced. These patients have a less severe disease called Becker muscular dystrophy. Figure 3. Duchenne muscular dystrophy is most frequently caused by deletions of one or more exons (exon 51 in this example), resulting in a disruption of the genetic code (illustrated by the fact that exon 50 does not fit to exon 52). When the genetic code is disrupted, no functional dystrophin protein can be produced, resulting in Duchenne muscular dystrophy. Becker muscular dystrophy is also most frequently caused by deletions of one or more exons (exon 50 and 51 in this example). However, these deletions maintain the genetic code (exon 50 fits to exon 53) and therefore a partially functional dystrophin protein can be produced. The exon skipping approach aims to restore the genetic code by deleting an extra exon on transcript level (see http://www.exonskipping.nl/background-technology/ for an explanation). The disadvantage of this system is that transcripts are temporary gene copies with a high turnover, and therefore patients need to be treated with the exon skipping compounds regularly (weekly in current clinical trials). If it would be possible to delete an extra exon on DNA level, this would result in a permanent effect: all transcripts produced from the DNA would have a readable genetic code. 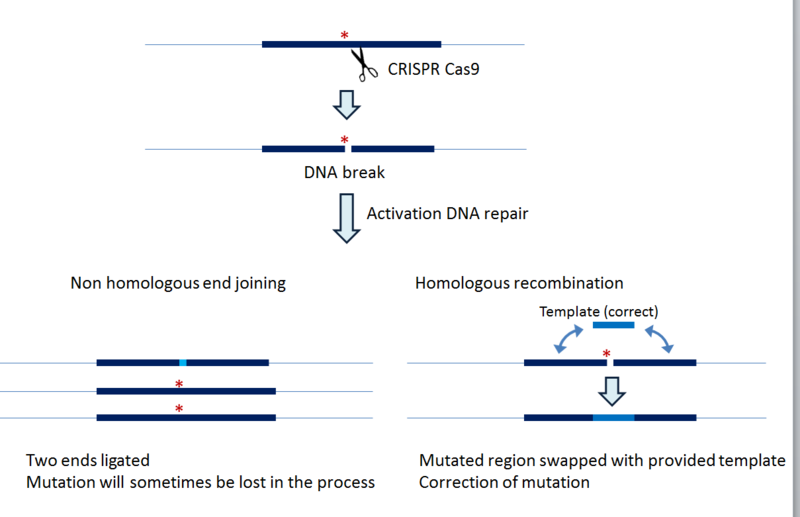 The CRISPR technology has been exploited in several ways to delete an exon – the two most commonly used are explained in Figure 4. The first system uses two guides to target a break at each side of the exon. When the repair system repairs this break it will sometimes join the two outer ends, so the whole exon is deleted. This restores the genetic code on DNA level. Another option is to use only one guide and generate a single break close to the border of the exon. This is where exon recognition signals are located. When the break is repaired, some DNA subunits will be lost in the process, and consequently the exon recognition signals will be lost. So while the exon is still present in the DNA, it is no longer recognized by the cellular machinery and will not be included on transcript level. Now the genetic code is restored on transcript level. Figure 4. The two most commonly used CRISPR strategies to correct the genetic code for dystrophin mutations. In the top panel the deletion is made larger. For this, two guides are needed that will cut at both ends of the exon that needs to be deleted (in this example exon 52, because exon 50 and exon 53 fit together). When the double cuts are repaired, sometimes the outer ends will be joined and the exon will be deleted. In the bottom panel, the exon is made unrecognizable. When transcripts are generated, each exon is recognized by the cell machinery because it contains special recognition signals. A break is generated just before the exon. Because the repair system is not perfect, the recognition signals will be lost after repair of the break. 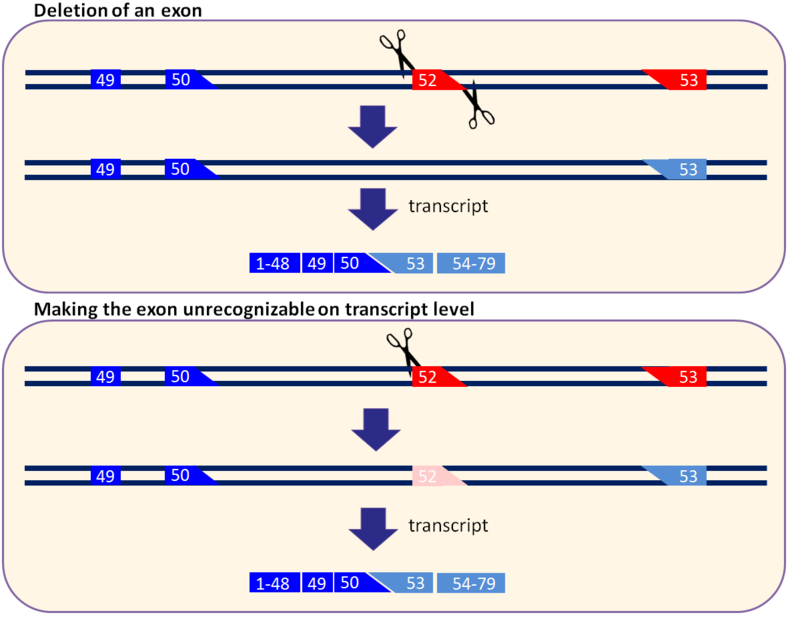 Consequently, the exon will no longer be recognized and the resulting transcript will lack it (in this example exon 52) and the genetic code will be restored. For both methods transcripts are generated that allow the translation of a partially functional Becker-like dystrophin protein. Permanent exon skipping! That sounds amazing. So what is the catch? The catch is that you need tools to introduce the breaks: the Cas9 enzyme that generates the DNA breaks and the CRISPR guide(s) to lead the Cas9 enzyme to the proper location in the DNA. It is not enough to have these tools in one nucleus of one muscle fiber – the tools need to be delivered to a significant number of nuclei in muscle fibers of each of the more than 750 different muscles of the human body – because almost all of these are affected by Duchenne. How can we do this? Antisense oligonucleotides (AONs) that are used for exon skipping are small and will be distributed throughout the body and take up by muscle fibers to some extent. However, when you inject the Cas9 enzyme, it will not be taken up by muscle fibers. The trick that is currently used is to generate a viral vector containing the genetic information for the Cas9 enzyme and another one containing the genetic code for the guides. The adeno-associated virus (AAV) can used to deliver these genes to muscle (AAV can infect muscle with reasonable efficiency). AAV vectors have been used to deliver Cas9 and guides to muscle of Duchenne mouse models. Indeed! There are three papers in Science showing that CRISPR works in DMD mouse models. So the proof has been provided and we should start planning a clinical trial! Like all therapeutic approaches, gene therapy relies on muscle quality. Dystrophin prevents muscle damage during exercise. Once muscle has been lost, it will not return. Therapeutic approaches currently in development for Duchenne aim to slow down disease progression, they will not bring back muscle that is lost – they are not cures. Genome edition is no exception to this. When disease progresses in Duchenne patients, muscle tissue is replaced by fat and adipose tissue. Fibrotic and adipose tissues do not produce dystrophin, so repairing the dystrophin gene in these tissues will not have an impact – only repairing the dystrophin gene in muscle tissue will. As with most therapies, there are risks and potential side effects. Genome editing however has an added risk in that it targets DNA, so the effects are permanent and will not go away when treatment is stopped. The genome editing system is not fool-proof, CRISPR has been known to direct Cas9 also to other locations than the target, leading to cuts in the DNA at the wrong location. There are multiple ways in which this can leads to problems, for example this can lead to cells being unable to produce proteins that prevent tumor formation. As said, the effects in the DNA are permanent and cannot be undone. There is no undo button with genome editing. I am not saying this is the end of all hope for genome editing for Duchenne. I am pointing out that we need to be cautious. We should not expect too much from this approach (it is not a cure, it slows down disease progression) and we should not expect things too soon. Before clinical trials can be started, the delivery of the tools needs to be optimized. This should not be underestimated. The step from a 25 gram mouse with 16 gram muscle to a 30 kg Duchenne boy with 20 kg muscle is huge. Furthermore, more information needs to be obtained on the risks of this technology – not just for Duchenne, but in general: How serious are the risks? Can they be mitigated? Do they outweigh the risk of having Duchenne? This will take time – something I know Duchenne patients do not have. However, I know from personal experience that rushing into clinical trials seldom turns out well and leads to further delays.